Today, my friends at Mad About Patchwork are featuring me as part of their Sew Canadian summer feature, so click here to go and read their post, and then come back for a few more details. 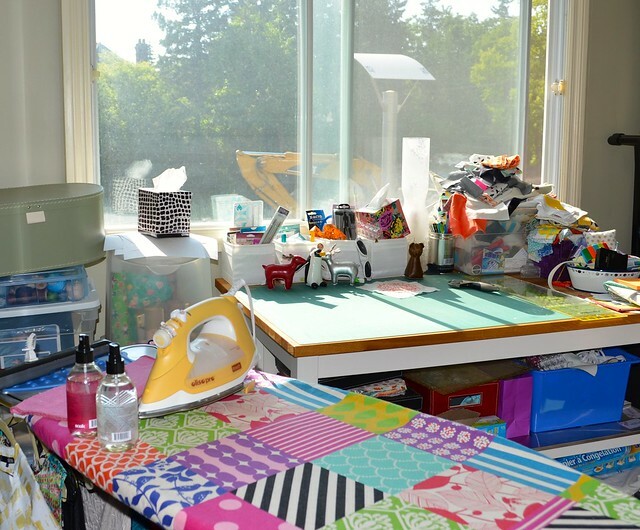 A bunch of fantastic Canadian bloggers have been sharing the details of their sewing space and the answers to a bunch of questions all summer and you can check them out here. 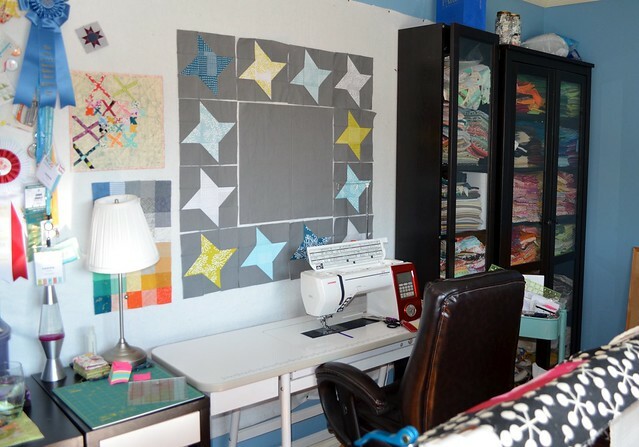 You can join in by posting pictures of your sewing space in the Mad About Patchwork Sew Canadian Flickr group here and that enters you into a sweet giveaway too. I sew in a, for now, vacant bedroom - if you are my guest, you either get one of my kid's room or I put you up in a nice hotel down the road. My APQS Millennium long arm machine was new this year in February. It has a 10 foot table, which is the shortest table available as any longer and it would not fit in the room. 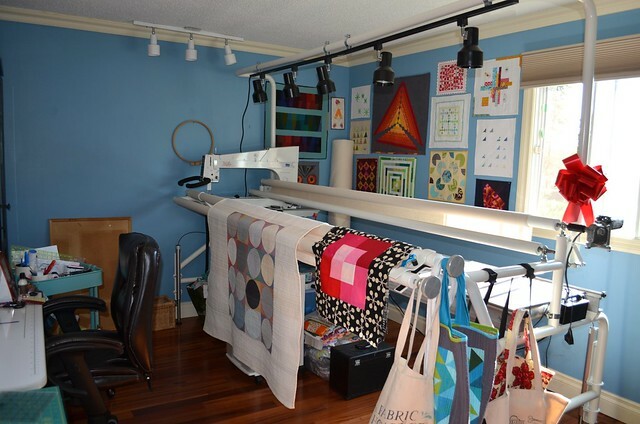 The long arm does have 6 feet of space on the back between it and the wall and if I am quilting I roll my sewing chair out of the way to give enough room in front. A bonus I had not realized would be available when squishing the long arm into the room was that I can store things under the machine. I need to find some kind of nice looking cupboard so that it keeps the dust away from the boxes and bags (which are usually overflowing) now stuffed under it. The arrival of the long arm changed the space all around. So now my Janome Horizon is right up against my old design wall, as are the shelves of fabric. I thought this would be a bad idea but it is so nice to lay out your block or quilt right in front of you and then just be able to take it down to piece it. However this design wall is not big enough to lay out a whole quilt so I am thinking I will tack up another piece of batting on the empty space you see in the picture above the one above. My version of making a design wall is quite economical, thumb tacks and batting, right on the wall. Here is the view from behind the long arm. And photos you see on my blog of quilts on the design wall are taken from here and cropped. You can see my "show off" corner too and yet another cupboard of fabric. I have been keeping my featherweight out too, so that I will remember to use it too. So here is one of those "confession photos". 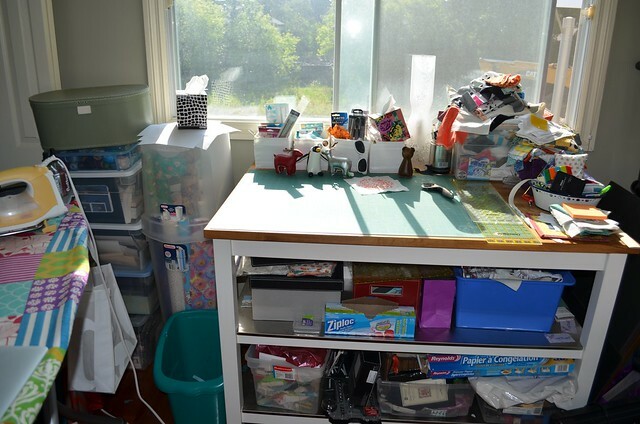 This room has a nice closet but it is still full of other crafting and sewing supplies that I need to go through and reorganize so that I could use that closet efficiently. And I do have a chair stuffed in the small amount of space there, so that I can relax and think when I am sewing or for when someone wants to keep me company for a while. The astute quilters will have realized that important things were not present in that room - no place to cut or iron. I have stuffed that into the adjacent room which was supposed to serve as the home office but never really has. It is more of the knitting, storage, messy stuff left on the floor room. Moving my cutting and ironing stations there has actually forced me to tidy it up some (but not enough yet). I cut fabric on a counter size table from IKEA. When I forget to put the fabric away, it piles up on the corner until it covers all but a tiny bit of the cutting mat which finally drives me to tidy it up again. You may also have noticed the construction site next door through the window. We used to live next to a lovely little forest. Now we get to observe the house building process, probably for the next few years as they are building 8 houses there. When the work is not shaking my house to bits, it is pretty interesting, although not nearly as peaceful as the birds and urban wildlife were. These shelves arrived in this room in June as my son jettisoned them from his. It was prefect as it seems that my fabric supply was growing faster than I was using it up - a mystery of the universe how that could happen I think, right? But they mean that my ironing board is pushed further into the room. I'm not showing you the other side of that room as it is full of shelves, and messes. 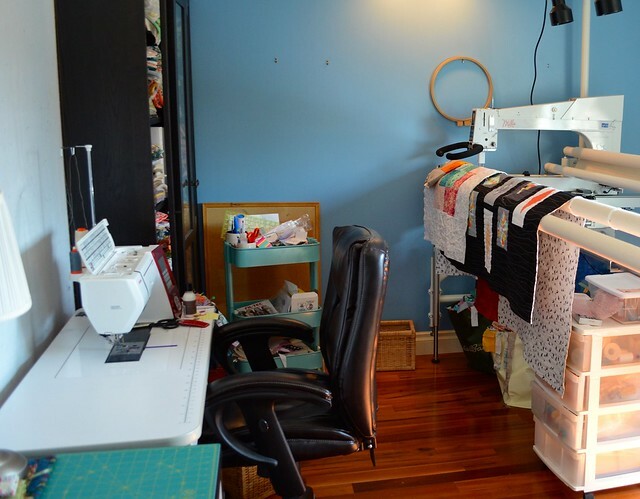 So there you have it, the space where I hang out when I sew. I really do try to not tidy it much, as that takes up limited sewing time. But there will need to be some major changes in late October as I ordered this fantastic fancy table from Martelli at the AQS show I have been at in Grand Rapids (the show price was fantastic and they were very generous to me in regard to the high cost of shipping to Canada too). I have much more to share with you about the show this coming week too. Today, I am plan to do very little and enjoy relaxing during a nice hot spell in Michigan. Thanks so much for sharing this, Leanne. It's so great to see how other people organize and where they get creative! LOVE IT!! so real!! makes me smile!!! alot!!! 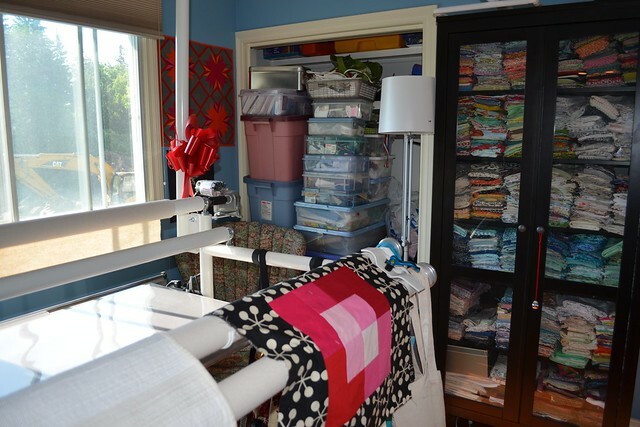 So glad to see that everybody's sewing room looks full even when organized and cleaned up! :-) i am in total AWE over ypu Longarm! I have a question about the table your Janome is set into. Is this a Janome table or is it by another brand? I am on the look out for a table for my janome Horizon. Is this table high enough to fit under? I am tall and have long legs. Do you think I would fit under it? Well at least you kept it honest ;o) Hope you enjoy your relaxing day! How fun to have such a great space for creating. It's like a fabric store in there. how good to see where all your creativity goes on you have a great room for all your things, very envious of all that fabric. 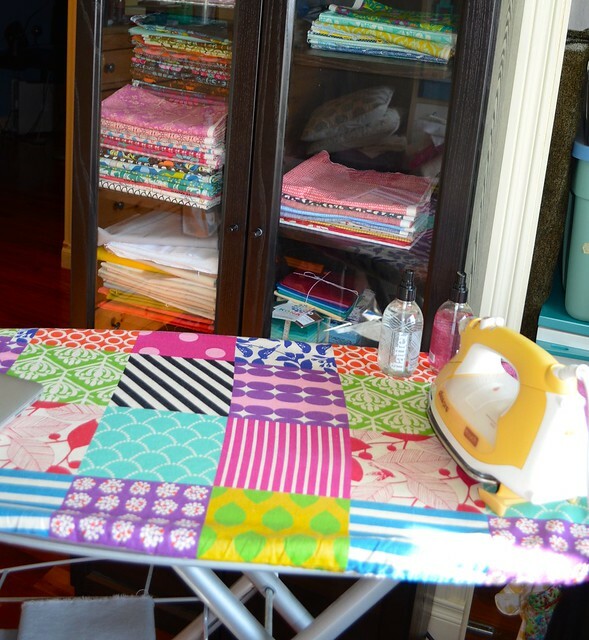 The cutting table looks so useful with those sheves underneath, lots of good storage there and wow as for the long arm quilter can see you have lots of fun using that. Lovely to see your space and have you talk about it honestly. I am suspicious of the totally shiny super tidy spaces, ha. We all work differently but it's nice to glean storage and organisational tips from how others do it. I need to overhaul my space to make it adapt back to a guest room more easily if necessary, but not looking forward to that process! Interesting! 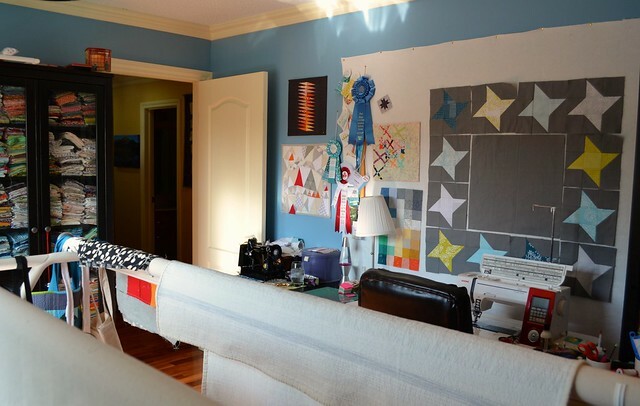 I would guess your sewing space is minimalistic just like your clean designs :) I wouldn't mind spending some time in your space :) There are plenty of fabrics to play with. It looks like a lovely room!